This piece of art can be walked on. I took a painters drop cloth and cut it to size and sewed the edges. 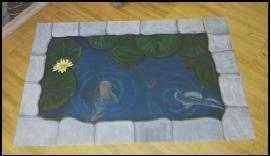 I then painted this rustic fishpond on it and applied 4 coats of polyurethane. I say it can be walked on but it is funny how many people would walk around this piece instead.